MK Erel Margalit quoted your article without giving name/credit, and attacked the PM in the Knesset. He called it Hon-Darkon-Olam Tachton [“Passport Wealth from the Underworld”].” You know what it means. Cool! Your blog post was the talk of the Knesset today. MKs used it to question Bibi and he answered the question. It seems like Israel really needs your website in order to make headlines. The Q&A made the TV headlines, you did great! 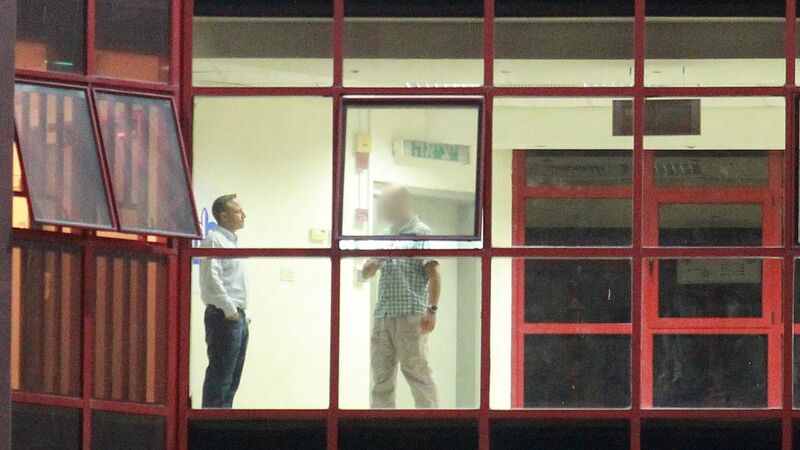 Ari Harow, suspect in Netanyahu corruption probe, at Israeli police headquarters during his ten hours of questioning yesterday. Margalit also waved a printed copy of my last blog post on the floor of the Knesset as if to prove that foreign media were reporting the story, so he was entitled to bring it up. This is a long-used tactic by the news media to avoid the censorship regime. If a story is printed abroad then the censor has no jurisdiction over it and it may also be reported by Israeli media. The irony here is that there is no censorship of the story. That means that Israeli legislators have so internalized the concept that they act as if there’s censorship, when there isn’t. In situations like this you don’t know whether to laugh or cry. It appears that my posts and this debate has challenged authorities to reveal more than they previously had. This resulted in Haaretz publishing a far more detailed account (Hebrew version) of the charges in the case. This account largely agrees with what I’ve published and adds new details. The major suspicion is that Yair and Sara Netanyahu concocted a scheme with Likud U.S. fundraiser, Ari Harow, to solicit large sums from wealthy American Jewish donors. These donations were not for political purposes, but rather to finance the high-living life-style which both had become accustomed to. Haaretz says the main donor under suspicion is “a relative of Shlomo Rechnitz.” I’m not sure why they simply can’t name Yona Rechnitz as this is clearly the figure to which they’re alluding. It should be noted that other sources have named Shlomo as the target. But Haaretz may be correct in targeting Jona. After all, he is the same one who feted police brass with prostitutes, diamonds and Las Vegas junkets. All this begins to resemble the Ehud Olmert scandal in which Morris Talansky played the role Harow is now playing. You’ll recall that Talansky was a “good old boy” who had served as a professional fundraiser for a number of U.S. and Israeli Jewish charities. Through this experience he ended up as Olmert’s U.S. bag man, hefting Slimfast boxes full of cash to Olmert’s New York hotel from S. Daniel Abraham, meant for Olmert’s personal use. In the end, these aren’t the charges which toppled Olmert (though he was recently convicted on these counts as well). Instead, they got him for taking bribes from real estate developers during his tenure as Jerusalem mayor. But these were the charges that got people’s attention in the same way that the Rechnitz-Harow affair may do to Netanyahu. The Olmert case also resembles the Bibi scandal in that a state’s witness brought down the whole house of cards. In Olmert’s case it was Shula Zaken his loyal secretary for decades. In Bibi’s case it’s Harow. Though I do hear that there may be another state’s witness so far unidentified. Since Mandelblit is directly challenging the work of myself and other Israeli activists I say in response that he has it all wrong. The time to be transparent isn’t after the investigation is over. It’s during the investigation. If you wait too long then Netanyahu will have an opportunity to manipulate the numerous levers of control he has to suppress the facts and turn the debate in his favor; or at least tamp it down from a fire to smoldering embers. Silence never works in the public’s favor. It always works in favor of the elites. And Bibi is a reigning member of the Israeli political elites. Netanyahu and his family will be questioned as well, though they have not as yet. Originally, Bibi was to face interrogators tomorrow, though that has been postponed. It wasn’t attributed to you – but just generally stated as “published”. No one’s been charged with anything. There are only unsubstantiated allegations at this point. You mean, Olmert, not Netanyahu. In your 4th paragraph did you mean “toppled Olmert” rather than “toppled Netanyahu”? @ Steve Heeren: You are right. Thanks for the correction. @ Trapper Jon: Look up your English dictionary. There are two meanings of the word “charges.” Formal charges as in a police investigation, and charges made by anyone against someone else. So serious Israeli bloggers and activists, not police or prosecutors, have levelled charges against Bibi. Hi. You published a photograph of Ari Harow at the police offices. Who was the photographer? @ eli: Haaretz published the photo with no photographer credited. If you know or find out who the photographer is, let me know. I would be happy to credit him/her. I’m guessing that the photographer took the photo surreptitiously and doesn’t want to be identified so as not to get in trouble with the police. But that’s just a guess.